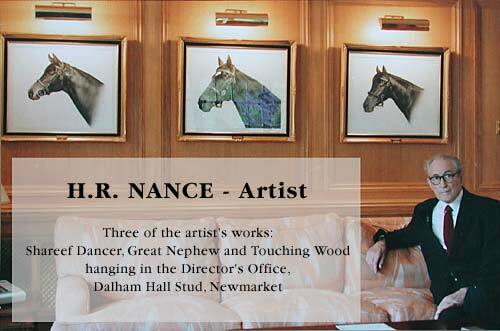 Harry Nance was a Sheffield-born artist who discovered his talent relatively late in life. 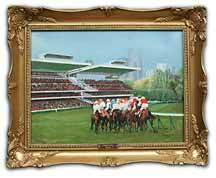 He was well into his sixties when he began painting local scenes and landscapes and in his seventies when he first thought of uniting his love of horses and horse racing with painting in oils and pastels. Harry's only formal training in art was a brief correspondence course in the 20's, but he went on to exhibit in London, Paris, Sheffield and Newmarket. 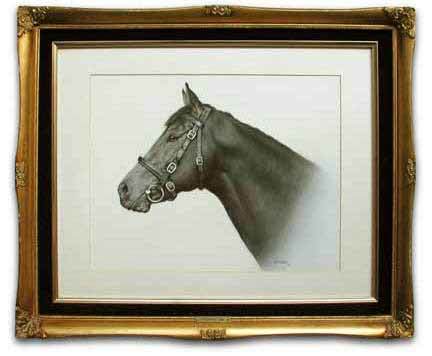 Collectors of his work include: The Duke of Devonshire; The National Stud; Danton Stud Farm; and Darley Stud Management Company. His best-known subjects were the horses Mill Reef, Red Rum, Grundy and Star Appeal and the racecourse at Longchamp near Paris. Several of Harry Nance's pictures are now available for sale through his grandson, Clive Williamson of Symbiosis, including: the original pastel of Moorstyle (right: offers over £750 considered - framed to 21 inches H by 24 inches W); Oils of Longchamp (below - £695 - framed to 15.5 inches H by 20 inches W) and Shareef Dancer; Pastels of Grundy, and Mill Reef; an artist's sketch of Machiavellian and a pair of unsigned prints of Mill Reef and Star Appeal. Also available is an excellent portrait of Henry Fonda in pastels. As featured on Carlton TV's series "Nice Little Earners". 14 Ash Hill Road, Torquay, Devon, TQ1 3HZ, U.K. This page sponsored by acclaimed UK ambient group SYMBIOSIS: "A treat for Head, Heart and Ears!"